Time after Time. Columbia Sinfonietta. Music of Fred Lerdahl, vol. 2. Bridge 9269. Waltzes. Schulte, Nickrenz, Sherry, Palma. Duo for Violin and Piano. Schulte, Winn. Quiet Music. Odense Symphony Orchestra. 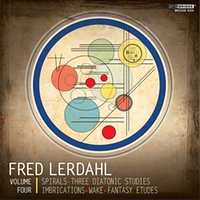 Music of Fred Lerdahl, vol. 3. Bridge 9352. String Quartets No. 1, 2, & 3.Daedalus Quartet. Music of Fred Lerdahl, vol. 4. Bridge 9391. Three Diatonic Studies. Mirka Viitala. Wake. Bethany Beardslee, Boston Symphony Chamber Players. New York Virtuoso Singers. Soundbrush Records SR 1027(2013). Anssi Karttunen. Mystery Variations. Toccata Classics TOCC0171 (2013). First String Quartet. Juilliard Quartet. String Trio. Members of the Composers Quartet.